We are not just fans, we are residents! This fantastic video courtesy of our own Littlekender and Sparowen. a fantastic MMORPG based on the literary classics by J.R.R. Tolkein. experienced riders with the riding skill. a stable horse quite rapidly to your destination. but are equally as fast and as sturdy. 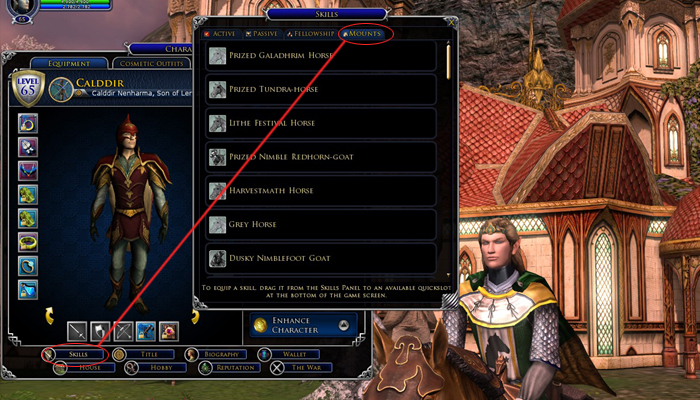 as they are added as a skill set and can be seen on the mounts tab of your character sheet. 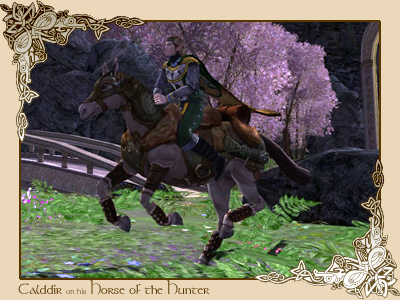 Available through the LotRO Store are some pretty awesome emotes that you can perform while mounted. Starting at level 5, you can obtain a whistle that will summon a temporary horse to get you where you are going. There are no special quests to do, nor must you spend a great deal of money. The horses vary in speed and sturdiness, and expire after a specific period of time. The temporary steeds are Standard Blonde Sorrel in appearance. 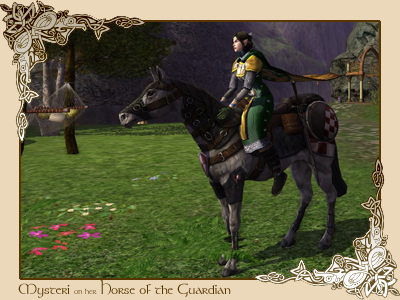 Available only from the LotRO Store or special introductory gift box. 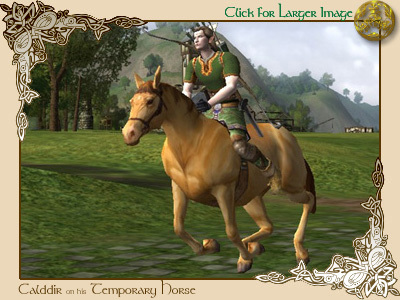 There are also steeds available on occassion in the LotRO Store in game. These are very special, full owned steeds with no time limitations. 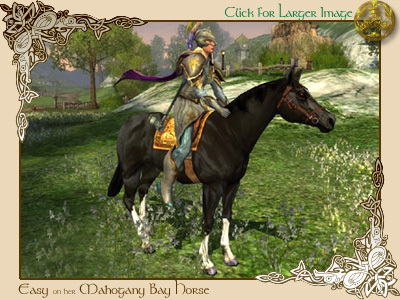 Originally SoM pre-order and AP only, but now only in the LotRO store (standard mount section). 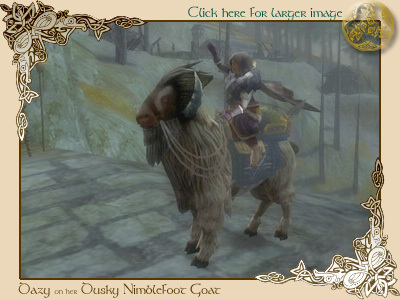 Equipped with all the tools for the adventurer, the goat is the only way to get around Moria. The Dusky Nimblefoot Goat is a dusky tan in colour and blue blanket and tack. Equally as fast as a regular steed but not at sturdy. Available occassionally from the LotRO Store (exclusive section) on a very limited basis. This magnificent steed has a dark charcoal coat with glistening chocolate undertones and amber eyes. It is bedecked with a glimmering saddle pad, a fiery neck guard and reinforced leather saddle, bridle and leg boots. This steed, at 168%, is faster than an standard steed. Due to its HP and speed, this is undoubtebly the best steed a character can ride at lower levels. Representing a new trend in steed adornment, the Steed of Minas Ithil is the first with full trappings and tack! This silver-grey horse, draped in a flowing bright blue and white covering with matching banner, is meant to display and carry the fearsome Guard of Isildur into battle. Only available from the LotRO Store (exclusive section) on a very limited basis! Keep your eyes out for availability! An offering fit for those with a bright and colorful spirit. This dark brown and white horse bears bright blues, greens and yellows on its caparison. Only available from the LotRO Store (exclusive section) on a very limited basis! Keep your eyes out for availability! Definately a steed for the hunting archer! 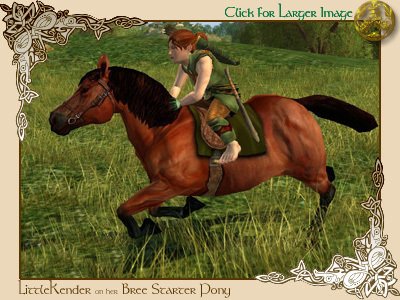 Wearing a fur saddle pad and breastplate, with a green saddle and neck guard and fur-lined splint boots, this steed displays everything that true Hunters need in their fight against Evil! Only available from the LotRO Store (exclusive section) on a very limited basis! Keep your eyes out for availability! A Guardian's steed must be strong and stout to bear the weight of its master's heavy armour and arms. This sturdy mount has an attractive steel gray coat with a black tail and its rugged tack is well designed to carry weapons, shields, and provisions for a long journey into war and danger. 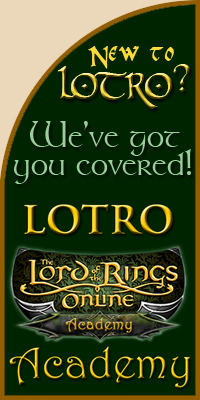 Only available from the LotRO Store (exclusive section) on a very limited basis! Keep your eyes out for availability! 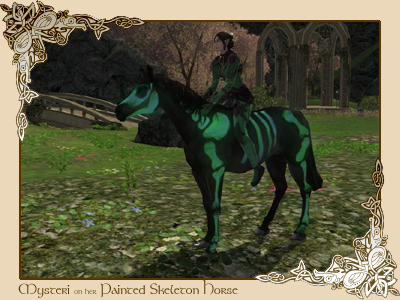 A glow-in-the-dark painted steed, coloured jet black and patterned with luminous green skeleton bones! Only available from the LotRO Store (exclusive section) on a very limited basis! Keep your eyes out for availability! A fleet-footed and sure-footed white goat able to travel as fast as any horse and travel through the dark of Moria, this alpine white goat with winged saddle and accents. Only available from the LotRO Store (exclusive section) on a very limited basis! Keep your eyes out for availability! Available only with the purchase of the LotRO Rise of Isengard expansion. Available only with the LotRO Rise of Isengard expansion. 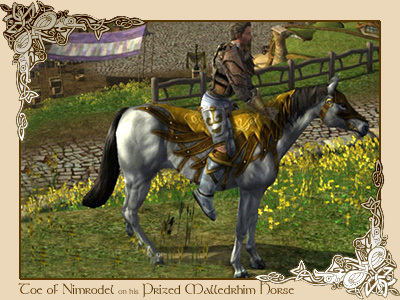 Available currently only with the of Rise of Isengard, the Rohirrim steeds are fantastic blonde sorrel steeds with Rohirrim designed drapery with individual symbols. 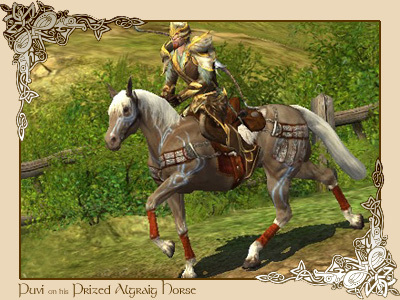 Equipped with ornate sturdy saddle and tack as well as facial and neck armor! 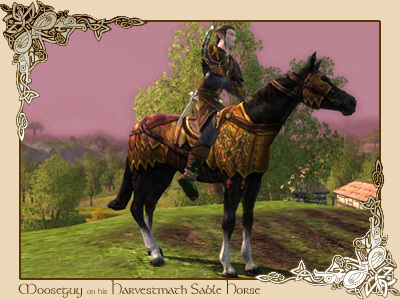 Faction and Festival Steeds are slowly becoming available for purchase in the LotRO Store! stats than earned (Prized) steeds and thus do not need faction reputation to own and ride. so be sure to check out the store deals often! 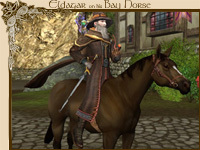 Available at lvl 5 to VIP members from Éogar at Hengstacer Farms in the Bree-Land Horsefields. No Riding Skill needed! While not as fast or sturdy as a regular, faction or deed steed, the Bree Starter is a nice way to get around at a lower level. A beginner version of the Breetown Liver Chestnut it is a rich Reddish-Brown with black points, has a standard saddle and forest green cloth blanket. 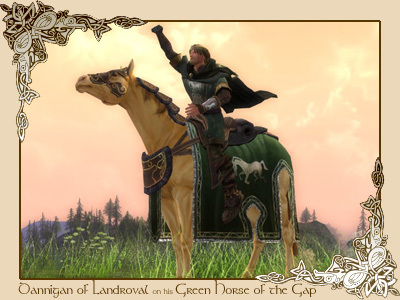 All players, upon reaching level 5, may opt to purchase the riding skill from the LotRO store for 95TP. demonstrate to Éogar that you can handle a mount, and you are done! common horse purchases from Hengstacer Farms in Breeland. 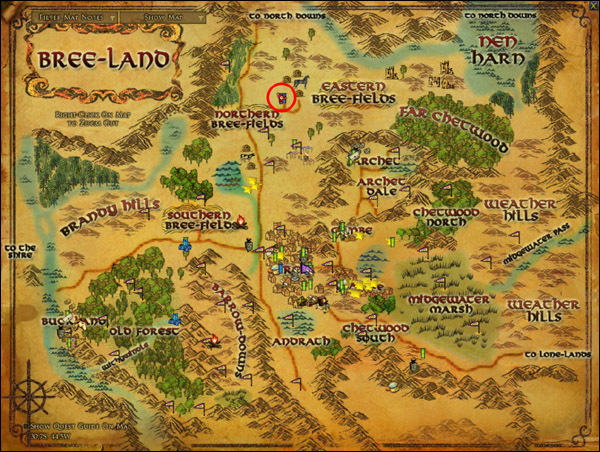 Hengstacer Farms are located north of Bree-Town. appear in your passive skills tab. Stable horses look like standard steeds but are much faster than any personally owned steed. They travel a specific path between two points and can only be mounted at a fixed unlocked stable. Stable horses do not require the riding skill to rent. 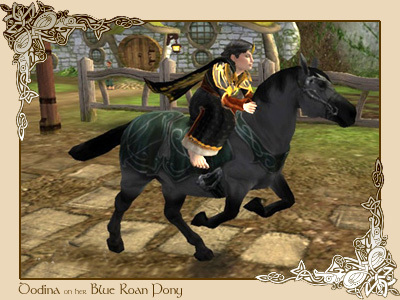 Standard steeds are slower than stable horses, but can be summoned and ridden anytime anywhere. and require the riding skill to ride. have the same stats as those purchased in game. Horses used to be items kept in your backpack, not skills, and took up alot of backpack space. Thus, many players upon earning the Grey Steed, ended up deleting it to make room in their backpack. Once deleted, the horse was irretrievable. 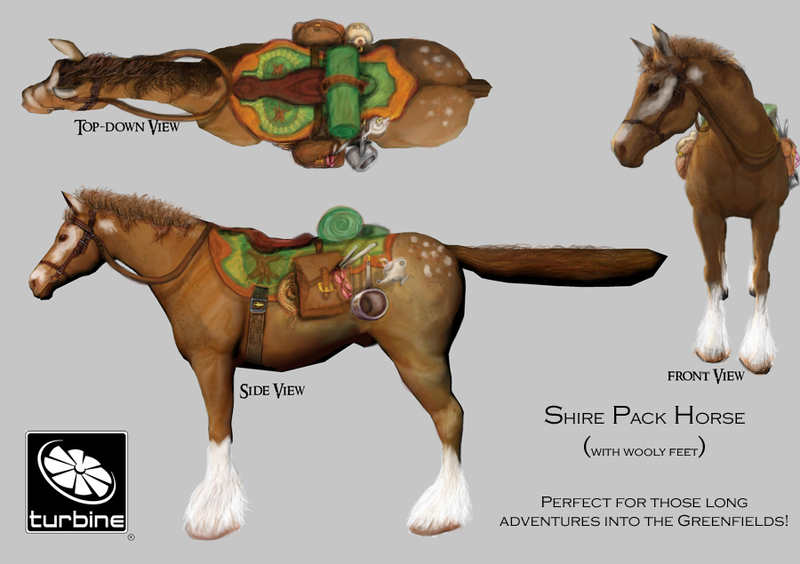 After steeds became skills, they no longer required backpack space. The steed was placed here at Eogar's Shop to allow people who had previously deleted the steed, to reacquire it. There is no need to ever purchase this steed, as it is a quest reward for completing Vol. 1 book quests. And you still require completion of the entire Vol. 1 book quests in order to ride it. 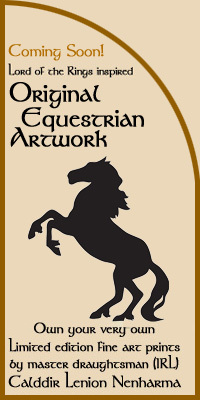 Available from Éogar at Hengstacer Farms in the Bree-Land Horsefields. The Chestnut is a classic rich brown horse with dark brown points and white star. Comes with a standard leather saddle and no blanket. The Blonde Sorrel horse is a classic light tan horse with white star. Comes with a standard leather saddle and no blanket. 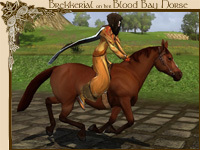 The Blood Bay horse is a classic reddish brown horse with dark brown points and white star. Comes with a standard leather saddle and no blanket. The Bay horse is a classic dark brown horse with dark brown points and white star. Comes with a standard leather saddle and no blanket. 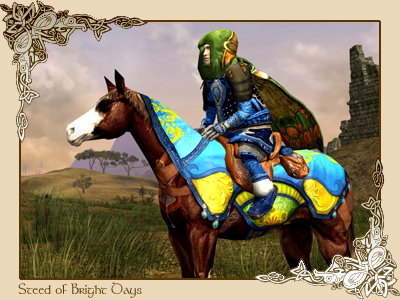 Faction steeds are offered as rewards for achieving reputation with different factions throughout Middle-Earth. 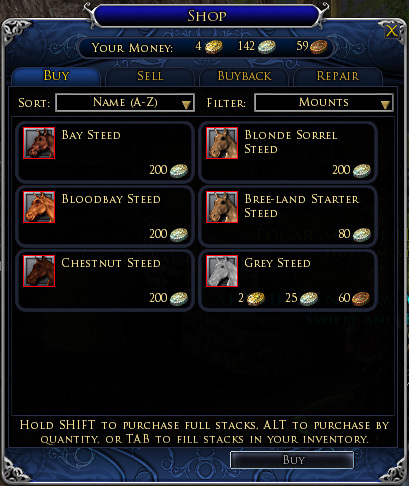 These steeds are not without cost and must be purchased with either gold or reputation items. They are equal to or faster than standard steeds, yet are much more sturdy. Prices listed are after the 5% discount received upon reaching Ally with the specific faction. Available from Rusu in the Great Lodge of Suri Kyla, Forochel upon achieving Kindred standing with the Lossoth of Forochel. The Tundra horse is a very sturdy horse specially suited for cold climates. It is a classic longhaired rich brown mount with white points, a standard saddle and no blanket. Available from Ganneldur in Telain Galadhrim, Lothlorien upon achieving Kindred standing with the Galadhrim Elves. The very prized Galadhrim horse is indeed one of the most majestic of all the horses in Middle Earth. It is a pure white horse with a standard saddle and a blanket handcrafted by the Silvan Elves of the Golden Wood. Available from Celegdes at Tinudir, Evendim upon achievement of Kindred standing with the Wardens of Annuminas. 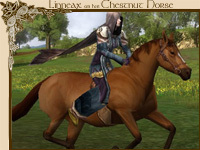 The Dark Chestnut is a sturdy brown and white painted horse with a standard saddle and orange and gold woven blanket handcrafted by skilled craftsmen of Evendim. Available from Hafgrim, in Gath Forthnir, Angmar upon achievement of Kindred standing with the Council of the North. 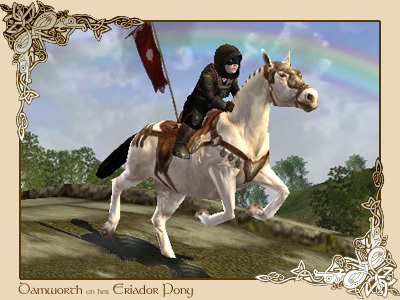 The Ashen is a sturdy grey and white specked horse with standard saddle and small red and gold blanket specially crafted by the skilled craftsmen of Angmar. 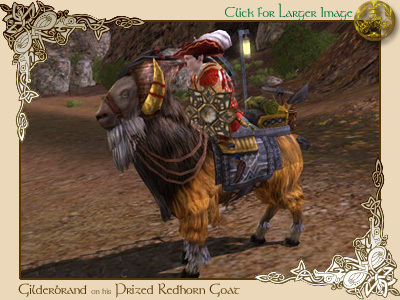 Equipped with all the tools for the adventurer, the Redhorn Goat is the only steed capable of traversing the rigorous Mines of Moria. Available from Tully Hopwood at Breetown Hunting Lodge upon achievement of Kindred standing with the Men of Bree. 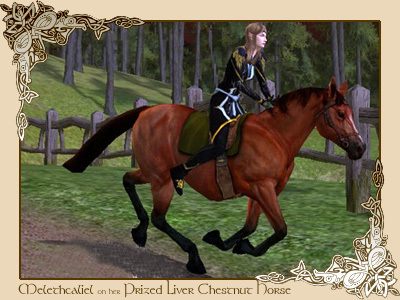 The Liver Chestnut is a rich Reddish-Brown with black points, has a standard saddle and forest green cloth blanket. Available from Cannuion at Echad Dagoras in Enedwaith upon achievement of Kindred standing with the Grey Company. 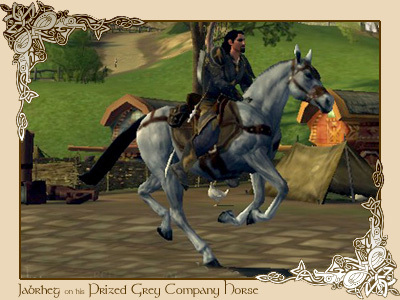 The Grey Company is a dark grey steed with black mane and tail. It is equipped with solid and sturdy leather tack crafted special for members of the grey company. Available from Mabon in the Hall of Making at Lhanuch Enedwaith upon achievement of Kindred standing with the Algraig, Men of Enedwaith. 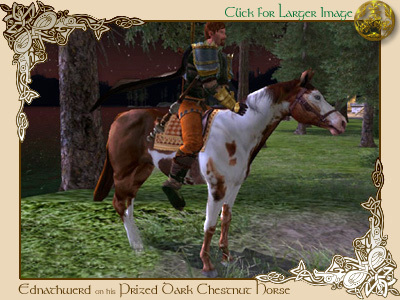 The Men of Enedwaith Algraig steed a cream colored dun steed with painted accents, a bright white mane tail and a decorative saddle with an ornate breastplate. It is equipped with solid and sturdy leather tack crafted by skilled craftsmen of the Men of Enedwaith. Available from Ivy Tunnelly, the kindred trader, in the members only room of the Bird and Baby in Michel Delving, upon achievement of Kindred standing with the Inn League. 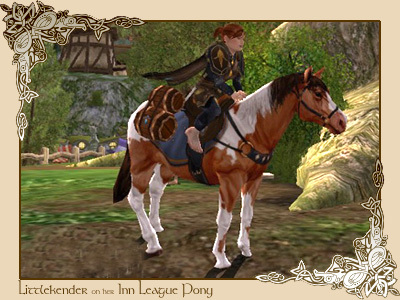 Sure to make certain you never run out of ale, the Inn League steed is equipped with 4 mini-kegs, light blue saddle blanket and is a brown and white painted steed. 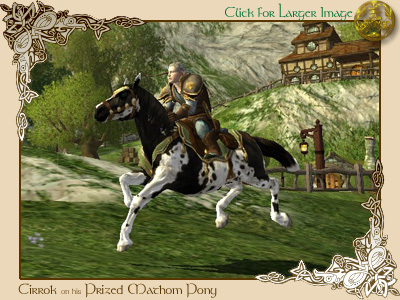 Mounting an Inn League Steed offers a very special secret Inn League bonus! Available from Gapi, the kindred trader in the Ale Association Ale-Hall at Thorins Hall, upon achievement of Kindred standing with the Ale Association. 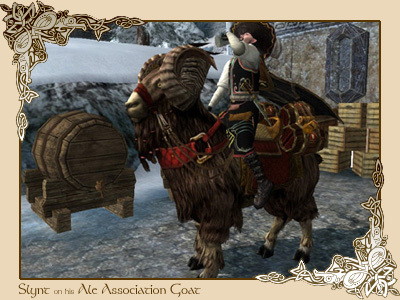 Contrary to the Inn League, the Ale Association provides a special Goat for their kindred members. The goat is equipped with 4 mini-kegs and a red blanket. Sure to keep you and your fellowship quite merry! Available from Manesir Goodbody in The Mathom House at Michel Delving, the Shire upon achievement of Kindred standing with the Mathom Society. The Prized Mathom Society Steed is chocolate brown and white painted steed with olive green and gold tack and full saddle and small saddlebags. Available from Althun in Blue Stone Garrison at Thorin's Hall, Ered Luin upon achievement of Kindred standing with the dwarves of Thorin's Hall. 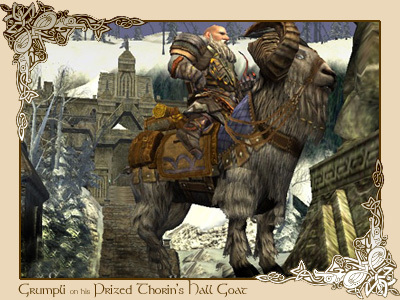 The Thorin's Hall Goat is dark grey goat with ornate dwarv-make saddle, storage chest and blue quilted saddle pad. A better way to get around Middle Earth would be hard to find! Available from Leoflac in Ost Guruth, Lone Lands, upon achievement of Kindred standing with the Eglain. 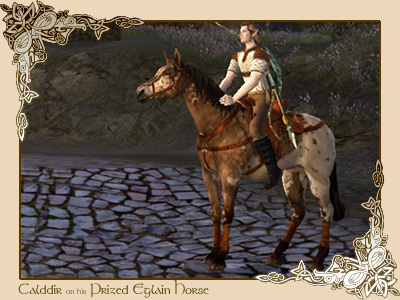 The Prized Eglain steed is a brown and tan Appaloosa styled steed with brown leather tack and full saddle with saddlebags. 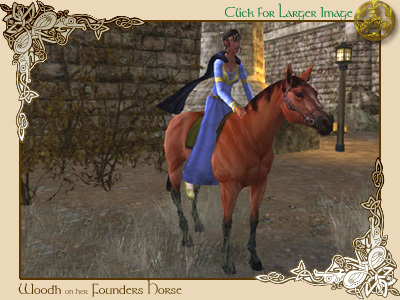 Prized steed available from Malenfang in a camp near the crafting hall at Esteldin, North Downs upon achievement of Kindred standing with the Rangers of Esteldin. 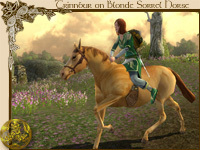 The steed of Esteldin is a blonde Palomino steed with white points and flaxen mane and tail. A full saddle and saddlebags sit atop an olive and gold blanket and brown leather tack. Available from Artharbain in Imlad Gelair, Rivendell, upon achievement of Kindred standing with the Elves of Rivendell. 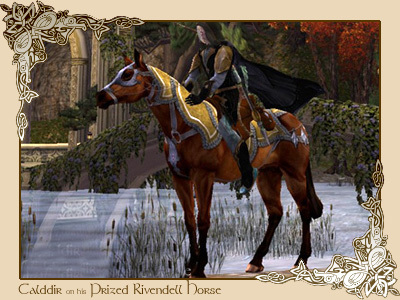 The Prized Rivendell steed is a rich brown steed with black points. Fancy elven gold and grey tack supports a full saddle and saddlebags. Available from Hafgrim in Gath Forthnir, East Angmar, upon achievement of Kindred standing with the Council of the North. 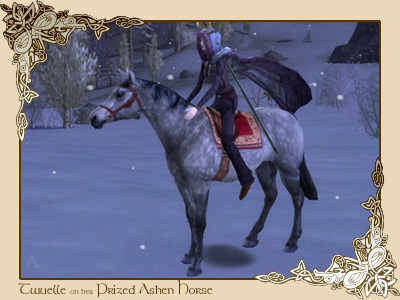 The Prized Free Folk steed is a dark grey steed equiped with fancy maroon and grey tack supports a full saddle and leg braces. Available from Millaesil at Thangulhad fortress upon achievement of Kindred standing with the Malledhrim of Mirkwood. 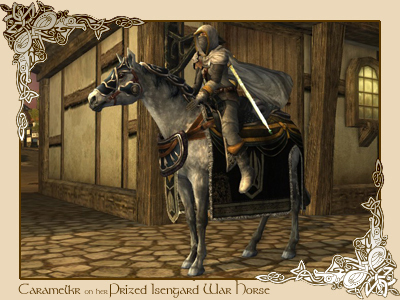 This is a beautiful steed for those who have earned the respect of the Malledhrim Elves. 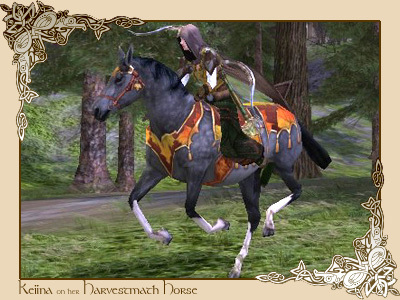 Like its name, it is a prized grey steed with black points and ornately carved brown and gold leather tack and saddle. Available from Gwion at Ox-Clan Merchant Camp in Isengard. This is a quite majestic mount suitable for those battling in Isengard. Like its name, it is a prized grey war steed with ornate black, grey and gold leather trappings, tack and saddle. Celebrating festivals is a very fun aspect to LotRO. Horses are given as rewards for participating in the four different festivals. receive tokens for exchange. Festival horses are equally as fast and as sturdy as regular horses. festivals take place. Know this one fact, Festival horses can only be obtained during their specific festival. 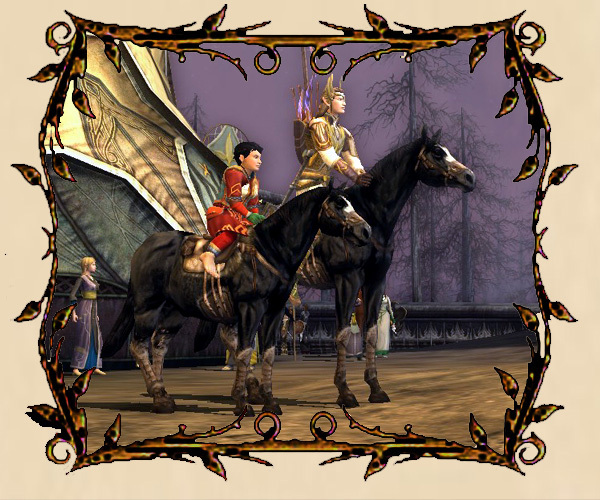 Keep in mind that you must still have earned the riding skill in order to ride a festival mount or to get the race quests!. 3. Receipt of Purchase / Document of Mount Ownership obtained by purchasing from the festival steed trader at Hengstacer Farms, Breeland at a cost of 500s (200s for horse owners). Available ONLY from the LotRO Store. 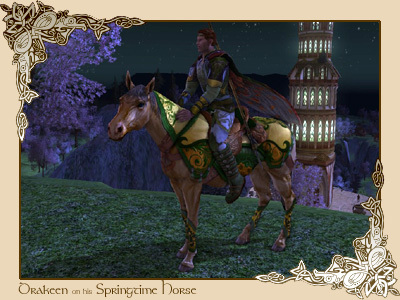 In celebration of the summer season, the Lithe festival horse has a standard saddle with a festive green and yellow sunflower blanket. Available from Cam Applewood at Hengstacer Farms in the Bree-Land Horsefields. 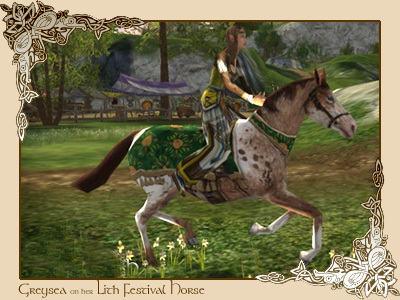 Cost: Festival Run Token, 12 Summer Festival Tokens, and receipt of purchase for a regular horse. 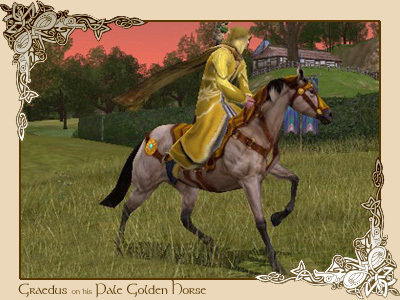 In celebration of the summer season, the Pale Golden festival horse is a pale tan colour with black points and has a very decorative saddle and tack in a guilded golden style. 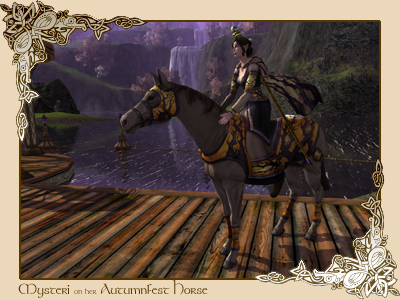 Cost: Festival Run Token, 20 Summer Festival Tokens, and receipt of purchase for a regular horse. 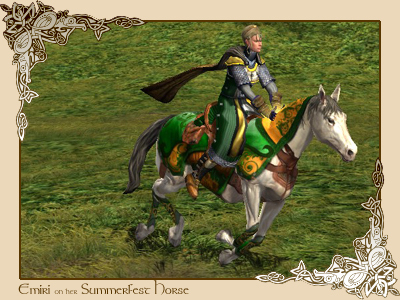 In celebration of the summer season, the Summerfest festival horse is a white colour with light grey mane and tale, and has a very decorative saddle and tack in a stylish green and gold. In celebration of harvest-time, the Harvestmath festival horse has a standard saddle and a festive fall leaf pattern blanket. Available from Will Peartree at Hengstacer Farms in the Bree-Land Horsefields. Cost: 1 Festival Run Token, 12 Fall Fest tokens, 1 document of mount ownership. In celebration of Harvestmath, the Harvestmath festival Sable horse has a standard saddle and a festive gold and burgundy decorative blanket. Cost: 1 Festival Run Token, 20 Fall Fest tokens, 1 document of mount ownership. In celebration of Harvestmath, the Autumnfest Steed has a standard saddle and a festive gold and dusty violet tree design decorative blanket. 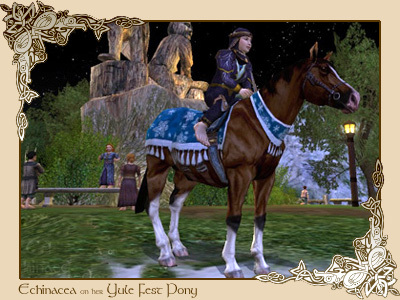 In celebration of Yule, the original Yule Festival Steed is a chocolate brown steed with white points. It is equiped with a standard saddle and a festive blue and white snowflake patterned blanket. Cost: 1 Festival Run Token, 20 Yule Fest tokens, 1 document of mount ownership. 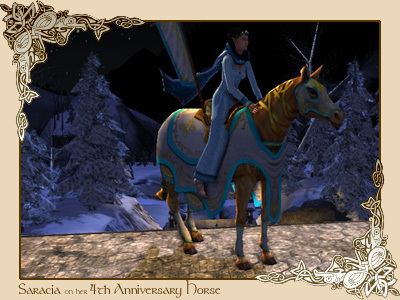 In celebration of Yule, the Yule festival Snow steed has a standard saddle and is adorned with a festive blue and white snowflake patterned blanket. 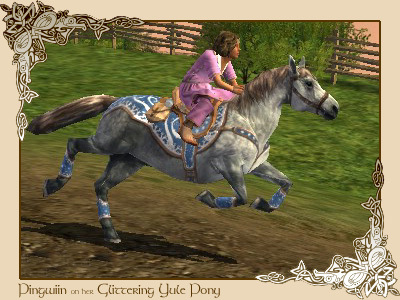 In celebration of Yule, the new Glittering Yule festival steed is a grey and white steed with dusty brown points. It has a white fur saddle and is adorned with a festive blue and white glitter patterned blanket and leg wraps. 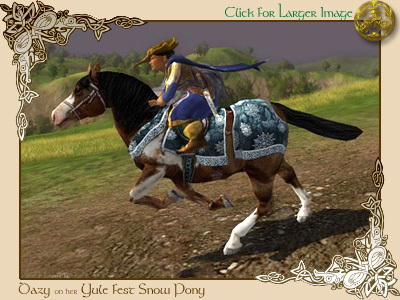 In celebration of Yule, the new Frosty Yule festival steed is a grey steed with festive blue and white saddle, blanket and leg wraps. A very nice addition to any stable! In celebration of the spring season, the Spring festival horse has a standard saddle and a festive deep green leaf pattern blanket. Bree-Land Horsefields for winning the spring festival race. Available from Will Peartree at Hengstacer Farms in the Bree-Land Horsefields for winning the spring festival race. 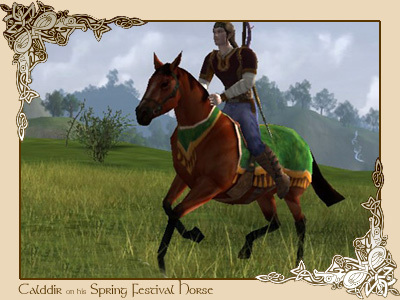 The Springtime steed is the newest of spring fest steeds,it is a aged dark blonde steed with grey mane and tail. A brown decorative leather saddle with green accents sits atop this steed along with a very decorative gold and yellow festive blanket and leg braces all with green trim. There are a few very special steeds available for specific achievements. These horses are normally cost-free but difficult to earn. 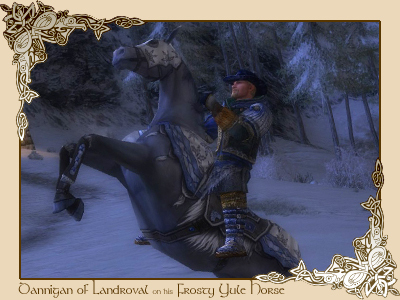 Available at lvl 15 from Éogar at Hengstacer Farms in the Bree-Land Horsefields only to founding players of LotRO. 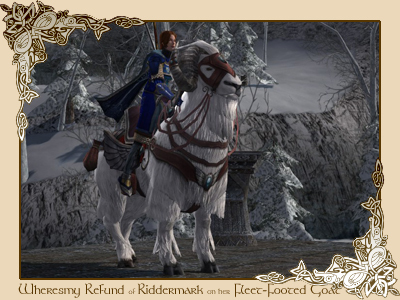 Cost: Bree-Steed receipt from LotRO Gold Edition, LoTRO pre order. 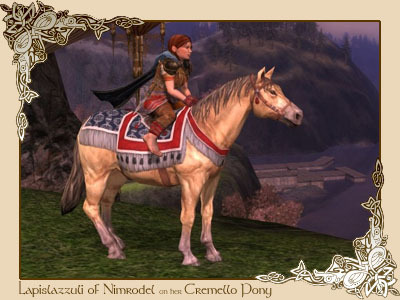 While not as fast as a regular, faction or deed steed, the Bree horse is a nice way to get around at a lower level. A beginner version of the Breetown Liver Chestnut it is a rich reddish Brown with black points, has a standard saddle and dark green cloth blanket. Available as a reward for completion of all the vol 1 epic book quests. A truly majestic steed, the Grey horse is a pure white steed fitting for a true hero. Comes with a decorative saddle and white and blue blanket. Available as a reward for achieving PvMP rank 9 from the Coldfells Quartermaster in Glan Vraig, in the Ettenmoors. The Mahogany Bay, also known as the 'Moors' horse, is a silky black with white legs. Standard saddle sits atop a gold and brown blanket. Available as a reward for achieving PvMP rank 12 from the Coldfells Quartermaster in Glan Vraig, in the Ettenmoors. 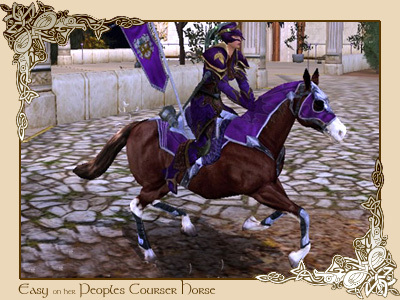 Undoubtedly the most difficult and most expensive steed in the game, the new rank 12 PvP steed, is a rich brown steed with white points and purple blanket, tack and has an awesome purple banner. A suitable steed for the most dangerous warriors in the Ettenmoors. Congrats to "Easy" from Insurrection! 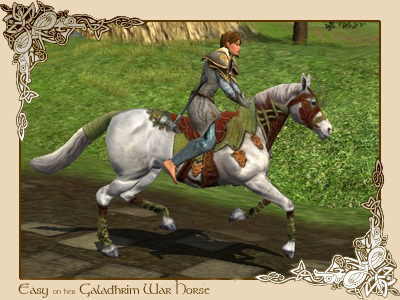 The Galadhrim War Horse is an awesome award for completing the Tempest of Dol Goldur meta deed in Mirkwood and, at 168%, it is faster than an standard steed. It is a pure white steed with an ornate green blanket and standard saddle. Also, like the Smokey Black, it has leg braces and war associated tack. 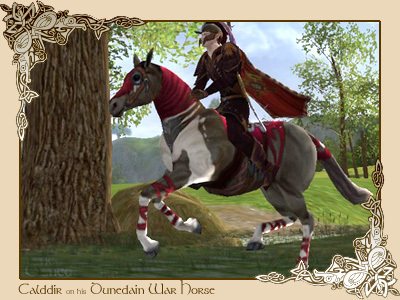 The Dunedain War Steed is a very nice award for completing the Saviour of Eriador meta deed chain. It is a white and grey steed with an ornate red blanket and silver inlaid decorative saddle. 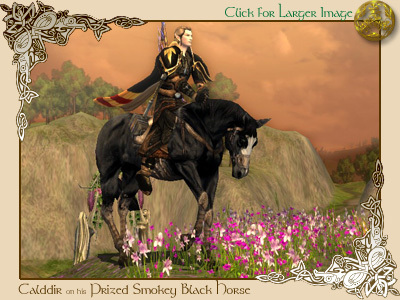 Also, like the Smokey Black and Galadhrim War Steed, it has leg wraps and war associated tack. 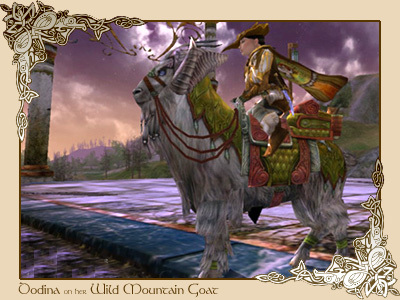 Equipped with all the tools for the adventurer, the goat is the only way to get around Moria. 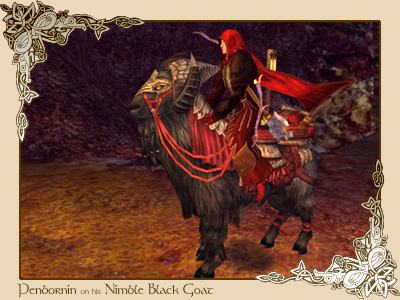 The Nimble Black Goat is a very suitable award for completing the Saviour of Khazâd-Dûm meta deed chain. This goat, at 168%, it is faster than an standard steed. Equipped with all the tools for the adventurer, the goat is the only way to get around Moria. The Wild Mountain Goat is a very nice award for completing the Saviour of Lothlorien meta deed chain. This goat, at 168%, it is faster than an standard steed. Available from a VERY rare drop from the secret treasure chest found hidden in the basement of the haunted burrow at the party tree in the Shire during the Harvestmath festival. During the Harvestmath festival, a special writ for this very special and rare steed may be found only in the haunted burrow. 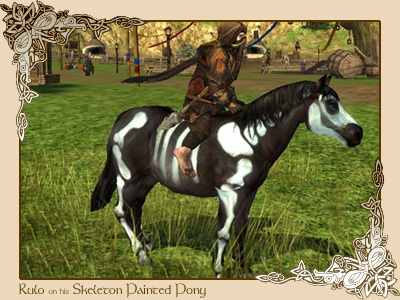 The skeleton painted horse is a jet black steed with regular saddle and painted with scary skeletal markings. Available upon achievement of Kindred rep with the Elves of Rivendell, Galadhrim Elves of Lothlorien, and the Malledhrim Elves of Mirkwood. 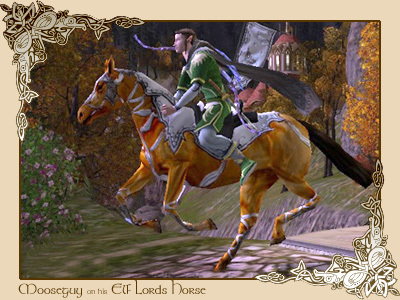 One of the fastest steeds in Middle Earth, the Elf Ambassador Steed, at 168%, is faster than an standard steed. 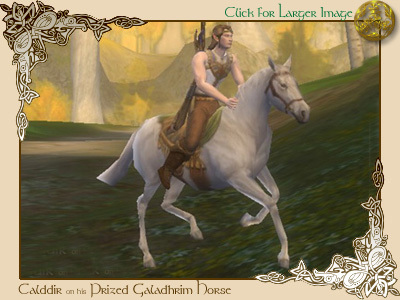 It is a rich blonde steed with white elven styled tack and an awesome white banner. The Elf Ambassador steed is quite fitting an Elf Lord. 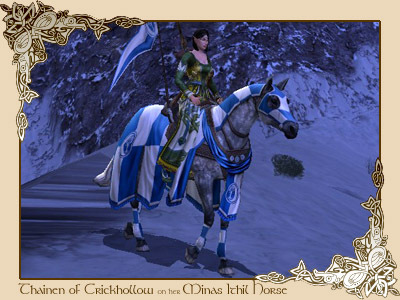 Available upon achievement of Kindred rep with the Mathom Society, Men of Bree, Thorin's Hall, Eglain, Rangers of Esteldin, Wardens of Annuminas, Lossoth of Forochel, Elves of Rivendell, Council of the North, the Grey Company and the Algraig. 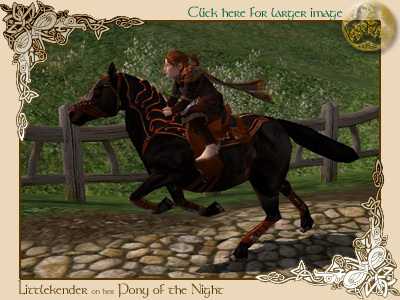 One of the fastest steeds in Middle Earth, the World Renown Steed, at 168%, is faster than an standard steed. 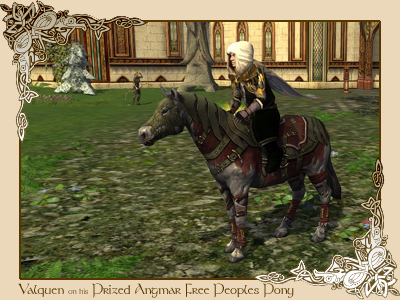 It is an majestic white steed with brown and gold elven braided styled tack and an awesome scarlet banner. A fitting reward to any soldier who has earned a place in the heart of literally all the peoples of Eriador. Available as a reward for attending PAX East. What a fantastic steed! 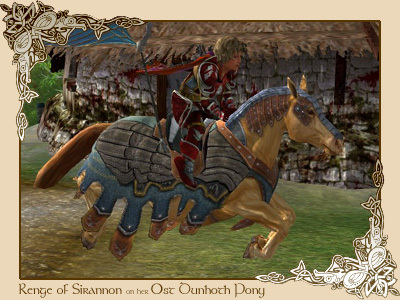 The Prized Osh Dunhoth War Steed is a blonde Sorrel coloured mount with tan leather tack, light blue drapery and embelishments, and leather armor. A very suitable award for completing such a difficult meta deed! 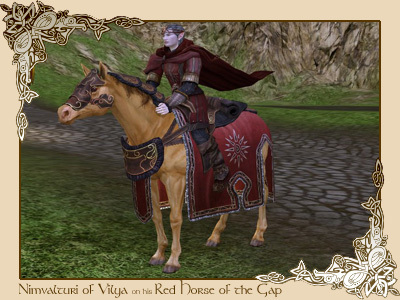 Available as a reward for celebrating the 4th Anniversary of Lord of the Rings Online. Costs: 3 Anniversary Race Tokens, 30 Anniversary tokens, 1 document of mount ownership. A new trend in steed adornment being established! Elaborate blankets and tack is used to adorn this beautiful Blonde Sorrel! 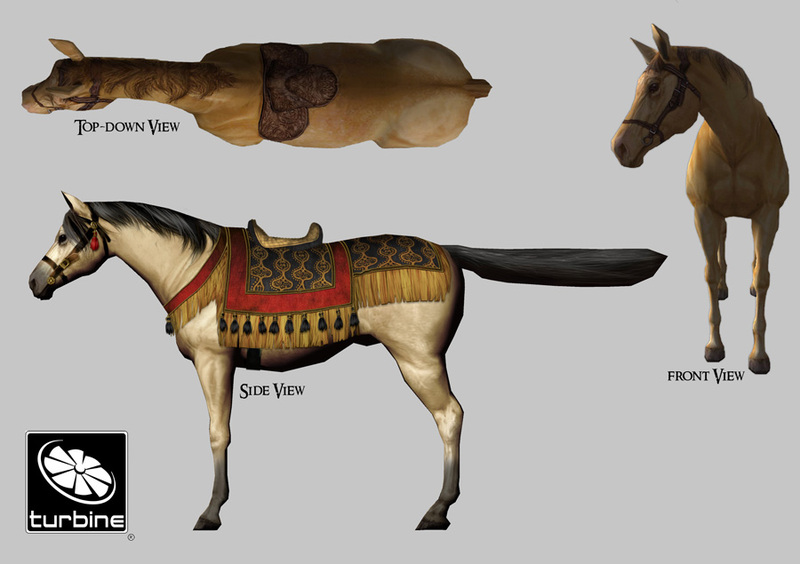 Up and Coming Steeds Presented here are steeds due for release soon in the game! one day we will indeed see them in Middle Earth. Well done designers! 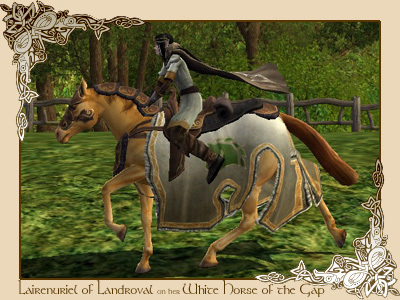 Created as an entry for the official LotRO Horse Design Contest of 2010, this entry was the runner up for the European contest. Congratulations to Sonofman for this most awesome design. Created as an entry for the official LotRO Horse Design Contest of 2010, this entry was the runner up for the North American contest. Congratulations to Bryng for this most awesome design. Naming your steeds can be as daunting a task as naming your character! Each steed has a special name by default listed in the above descriptions. 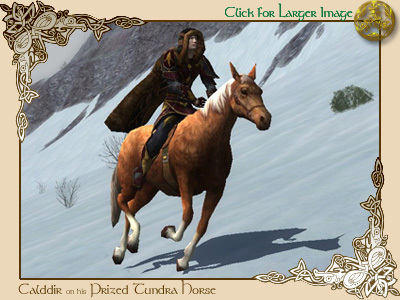 There are many resources on the web that you can use to help name your steed in Elvish. * Horse's hooves grow at a rate of about 1cm per month. * The forelock on a horse's head helps to keep flies out of the eyes. * Horse's legs are built so that they can sleep standing up, but to get a good rest they need to lying down. * Each leg has a small spot that looks like a scar called a 'chestnut'. * Horse's knee caps are not done fusing until they are about 3 1/2 years old. That's why many young racehorses are injured. 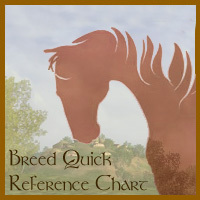 * Mares come in to heat around age 1, but usually can't be safely bred until 4. * Stallions are mature and can breed around 2 or 3 years of age. * A horse's heart weighs about 10 pounds. * A horse's back cannot bend, it remains stiff when the horse moves. That's why it's hard for horses to get up after rolling or resting. * The teeth take up more room in a horse's head than its brain does. * Horses can see colour. * Horses can see in two directions at once. * Horses have two blind spots where they cannot see- directly in front of them, and directly behind them. * Human hair and fingernails are made from the same protein as horse hooves. * Horses have 36-42 teeth, with females usually having 36 and stallions and geldings having 40-42. "Canine teeth", remains of fighting teeth, are present on some horses, usually males, in either 1 or 2 pairs. "Wolf teeth" can be present in males or females, and sometimes have to be pulled because they cause pain. 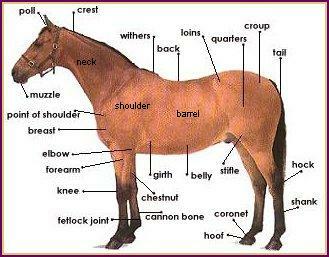 * Most breeds of horses have 18 ribs, 6 lumbar bones, and 18 tail vertebrae. Arabians have 17 ribs, 5 lumbar bones, and 16 tail vertebrae. * A full grown horse that weighs about 1,000 pounds contains approximately 13.2 gallons of blood. * Horses have about 175 bones in their body. * Horses make 8 basic sounds- snort, squeal, greeting nicker, courtship nicker, maternal nicker, neigh, roar, blow. * It is almost impossible for a horse to vomit-- if they do, their stomachs usually rupture soon after. * It takes a horse 60 days to double it's birth weight. * A horse focuses its eye by changing the angle of its head, not by changing the shape of the lens of the eye, as humans do. * While horses graze, they keep a look out for predators. * A racehorse averages a weight loss of between 15 and 25 pounds during a race. * Adult electric eels 5 feet to 7 feet long produce enough electricity - 600 volts - to stun a horse. * A horse weighing around 1000 lbs. voids from 1 1/2 to 8 1/2 quarts of urine daily. * A horse's gestation period is 11 months, but can be anywhere from 10-12 months long. LotRO is FREE to PLAY! 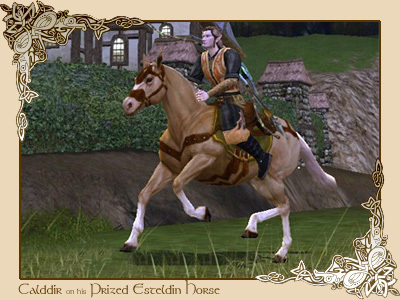 In real life, "Calddir" was born in the Horse Capital of the USA, thus has deep rooted equestrian interests. Feel free to use one of these banners and/or url if you wish to link to this page! 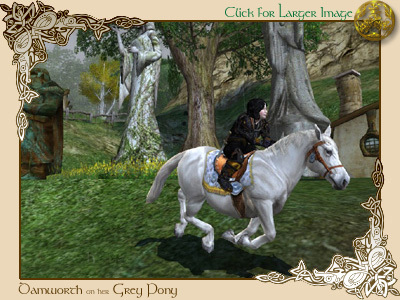 horses, ponies and goats in the Lord of the Rings Online game! Made by players for players! 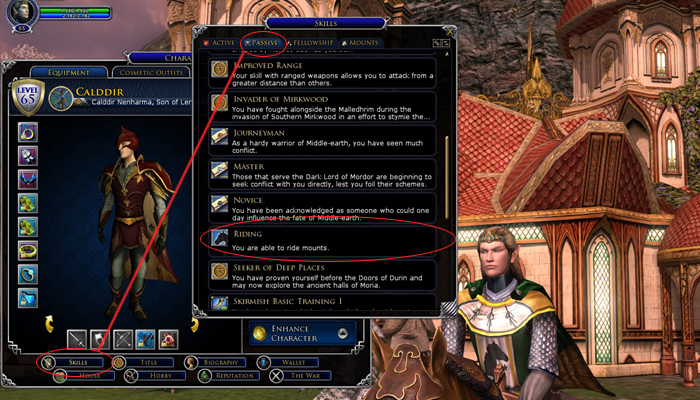 This is a fansite of the Lord of the Rings Online game.